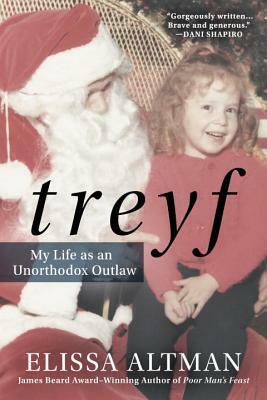 Treyf: According to Leviticus, unkosher and prohibited, like lobster, shrimp, pork, fish without scales, the mixing of meat and dairy. Also, imperfect, intolerable, offensive, undesirable, unclean, improper, broken, forbidden, illicit. Elissa Altman is the author of the critically acclaimed memoir Poor Man's Feast and the James Beard Award–winning blog of the same name. She writes the Washington Post column, “Feeding My Mother,” and her work has appeared everywhere from OnBeing.org and O, The Oprah Magazine to Tin House, the New York Times and the TEDx stage, and has been anthologized for five consecutive years in Best Food Writing.